In our desire to keep Tulsa Firearms a safe, enjoyable and pleasant experience for everyone, we would appreciate you taking a brief moment to reveiw a few of our rules for proper gun handling and use of our indoor firing ranges. We expect everyone to follow these common sense rules at all times. Any person that willingly ignores these safety rules will have their range privileges revoked. Persons exhibiting signs of infulence of drugs or alcohol will not be allowed on the premises. Period. No tobacco use of any kind is allowed inside of the Tulsa Firearms facility. Minors (under 21 for pistol, under 18 for rifle) must be supervised at all times while on the range. Range fees are charged as per person. Only one firearm and only one person, per shooting booth at one time. Tulsa Firearms reserves the right to refuse service to anyone. Anyone who violates any of these rules may be banned from the club, range, and/or pro shop and have their membership revoked. This applies to members whose guests violate these rules as well. Please respect Tulsa Firearms and your fellow members and guests. Absolutely NO handling of guns in the lobby. While coming to or on the Tulsa Firearms premises, all firearms are to remain in a range bag or case until you are in the shooter's booth, and then must be re-cased before being removed from the booth, unless being shown by a TFTA employee. Under no circumstance will you bring an un-cased firearm out of the range into the lobby. Only members or customers with a valid Concealed Carry License may carry a concealed handgun in the lobby where it must remain concealed at all times. No exposed handguns (with or without holster) may be worn, carried or handled in the Tulsa Firearms facility. Eye and ear protection is mandatory on all ranges. Please put eyes and ears on before entering the first range door. Rapid fire and drawn fire practice is not allowed without the supervision of a TFTA Range Safety Officer. Muzzles must be pointed down range at all times. Do NOT cross firing line for any reason. Minimum shooting distance is 10 yards on the pistol range (yellow safety line painted on the floor) and 25 yards on the rifle range (the back wall). While in the shooting range area, loaded or unloaded firearms may only be handled in your assigned lane with the firearm facing down range at all times. The bench behind you is to place your equipment on only. 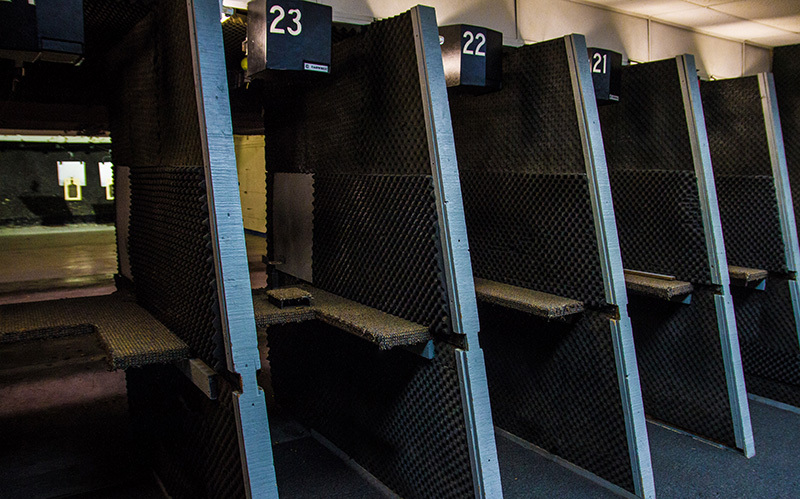 Handle, load or unload firearms, magazines, or speed loaders in your shooting booth only. Full cast lead, snake/bird shot, armor piercing, and tracer ammunition is strictly prohibited. This includes all steel jacketed, steel bullet or steel core rounds. These rounds can severly damage the backstop and are a fire hazzard. Anyone caught violating this rule will be banned from the range and his or her membership revoked. All ammunition (except rim fire 22) must have at least a partial metal jacket, full metal jacket, or jacketed hollow point. TFTA employees are required to inspect all outside ammunition not purchased at Tulsa Firearms. Pick up all your spent casings. All range ammunition (Zero brand) casings must be returned in the provided bucket when finished shooting. If you are shooting more than one caliber, a separate bucket wil be given to keep casings separate. At no time will live ammunition, brass casings, misfires/duds, or otherwise damaged cartridges be disposed of in any trash can or thrown down range. All firearms, range bags, gun cases, shooting accessories, coats, purses, etc. must be retained by the TFTA member, guest, or customer at all times and never left unattended. TFTA is not resposnsible for lost or stolen items. Handguns ranging in the caliber size of 44 Magnum or smaller must be shot only on the pistol range. Derringer type pistols (including any firearm without a trigger guard) are prohibited in the TFTA facility. No exceptions.